Decorated Bible. Single folio on vellum. Italy, doubtless Bologna, ca. 1325: 353 mm x 235 mm (justification, 222 mm x 145 mm). Double column, 50 lines. Foliated 398 in medieval pen. The Roman numeral XI seems to refer to an indexing system of some kind. Other leaves of this manuscript have a curious referencing system that seems to function like flip-book animation. Inconspicuous instructions to the rubricator in the lower margin of the recto and verso, but remnants of other such annotations are visible elsewhere. Catchword on the verso. The goatskin parchment shows considerable veining. 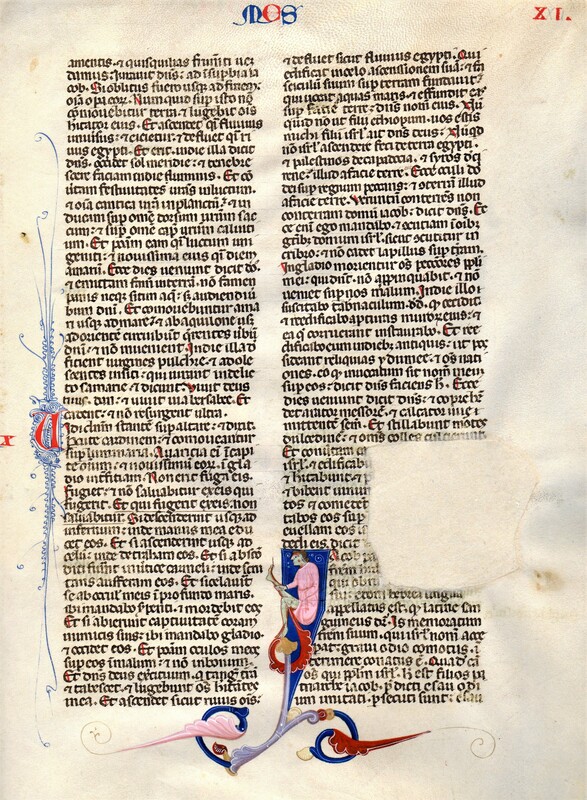 Decoration: a green-faced man in a pink robe holds his leg in a twelve-line initial I of Iacob (25 mm x 20 mm), on blue grounds with marginal extensions; on the verso two large decorated initials, one of fifteen lines, with floriate or geometric designs; three-line red initial with blue penwork in the margin; chapter numbers and running heads in red and blue. 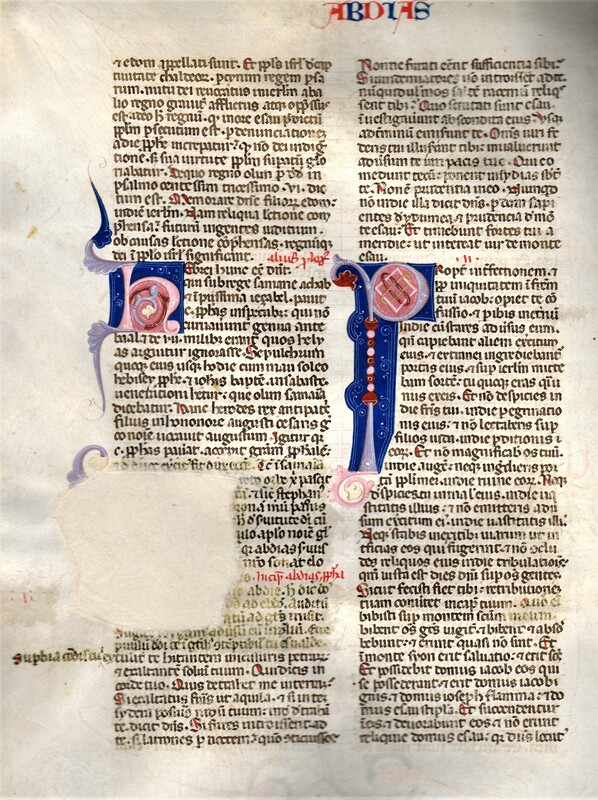 Text: from Amos 8.6 <calcia>mentis et quisquilias frumenti through the end, which is anomalous in comparison to the Vulgate text; two prologues to Obadiah (Stegmüller 519, 517 resp. ), followed by chapter 1 through verse 18 locutus. Condition: One of the initials, doubtless featuring Obadiah, has been cut out, leaving a blank space of approximately 50 mm x 60 mm, now infilled with modern Japanese paper in a quality restoration. This damage has led to loss of text, mostly on the recto. The rest of the folio has light soiling here and there and some trivial creasing. All the decorative elements remain in immaculate condition. Provenance: constituents of this bible have recently been for sale at Jörn Günther Antiquariat, Precious and Precise (cat. 17), nos. 19-20 (18,500 and 14,500 Euros resp.) and at Bloomsbury’s, Western Manuscripts, 10 July 2018 lot 52 (£2400).